New Jersey based Higher Education Student Assistance Authority (HESAA) is under scrutiny again after an email leak revealed a high level staffer’s email chain directing employees to not offer program details until asked directly. The leaked communication regarded a very specific forgiveness upon death option offered to parents of deceased children who may request dismissal of their children’s outstanding balances. ProPublica writer Annie Waldman reports that this is no surprise after HESAA’s actions were called into question following the aftermath of hurricane Sandy in November 2012 which left many student loan borrowers with delinquency alerts on their credit history. Although the storm proved devastating to hundreds of thousands NJ residents, HESAA was found to have immediately reported delinquent payment statuses to credit bureaus in the same month as the disaster. 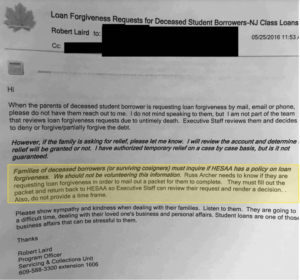 Another leaked communication in 2013 from a HESAA staffer suggested that all delinquency marks from that timeframe will be removed if the borrower actively disputes the delinquency. Must student loan borrowers jump through so many hoops for help that is already available? Who are these guys? Happy I don’t live in New Jersey! Our country has established relief options for the common good and to help us all grow stronger. Sadly, ethics and moral responsibility are not always shared equally amongst those in positions of power. Borrowers going through hardships should have all available options presented to them as they were intended.